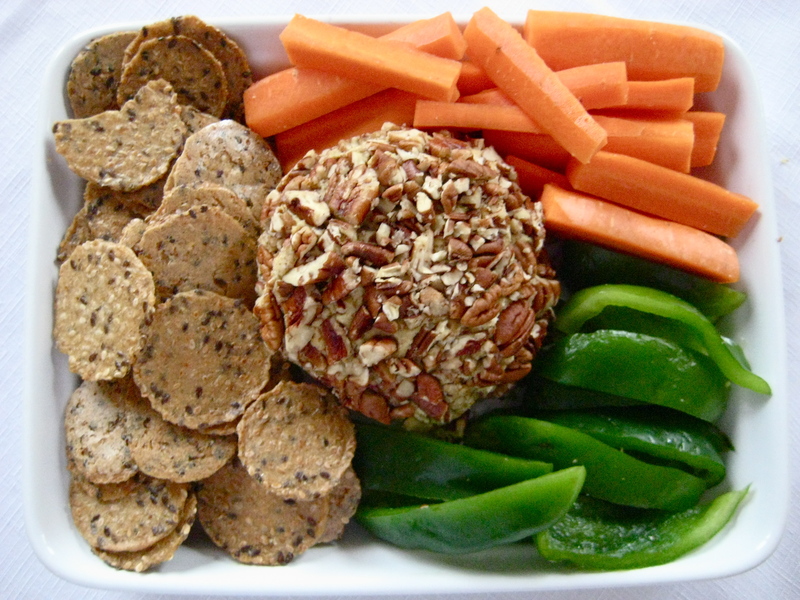 Making a vegan cheeseball might seem like a lot of work, but it’s actually just a quick whizz in the food process. No dairy analogs used here, the flavor comes from nuts, nutritional yeast, and a few seasonings and spices. Place almonds in the food processor and whizz until finely ground. Add all remaining ingredients, except for pecans, and blend until smooth. Test for seasonings. Spread chopped pecans onto a plate. Using your hands, form the almond/ tofu mixture into a ball, then roll in the pecans until coated. Wrap and place in refrigerator until ready to serve. (Overnight is best; you can do all of the steps without the pecans, then do that about an hour before serving). Serve with vegetable sticks and crackers.